The BSE oil, IT and metal indices led the rally, with gains of around 1% each. Markets gained for the second straight session to kick-off the September F&O series on a robust note, buoyed by heartening US economic data, fresh stimulus injection in China earlier in the week, ebbing global volatility after the bruising sell-off on Black Monday and dimming prospect of a Fed rate hike in September. The government’s announcement of the ambitious Smart City project, involving investments of Rs 48,000 crore for development of 100 smart cities, seems to have also fuelled the positive sentiment back home. The Sensex surrendered more than 300 points from the day's highs of 26,687 due to a subdued opening in Europe, but still managed to end stronger by 161 points or 0.6% at 26,392 and the Nifty settled a tad above the 8,000 mark at 8,002, up 53 points. But the broader markets had a lethargic session of trade, with midcap and smallcap indices ekeing out marginal gains to end at 10,759 and 10,992 respectively. The market breadth was negative. Out of 2,805 stocks traded on the BSE, there were 1,286 advancing stocks as against 1,410 declines. The September derivatives series is likely to be fairly volatile as the stock price erosion in the August expiry week and the accompanying spike in rollover open interest suggests that participants have carried their short positions into the new series. However, the stabilisation of the Nifty volatility index or VIX around the 23 levels, after touching a 52-week high of 35 earlier in the week, suggests that the volatility may be capped to some extent and any dip could be used as a buying opportunity in what is essentially a buy-on-dips market on a long-term horizon. The Asian shares extended their rally for the second consecutive session, on Friday, after firm US economic data cheered the mood of the investors. Chinese stocks rose for the second day, with Shanghai Composite surging nearly 5%. However, the European markets were trading marginally in the negative, albeit off their early lows, due to the onset of caution post the gains witnessed in the previous session. The rupee continued to trade weak against the US dollar, down 7 paise at 66.11, following fresh demand for the US currency from banks and importers on the back of higher dollar overseas. The rupee has been trading in a narrow range of 66.02 to 66.18 per dollar today. The BSE oil, IT and metal indices led the rally, with gains of around 1% each, while the banking and pharma indice ended in the red. Oil stocks flared up after oil prices rebounded by more than 10% on Thursday to post their biggest one-day rally in over six years following a report that Venezuela asked the Organization of the Petroleum Exporting Countries to hold an emergency meeting. ONGC soared by more than 5% at Rs 242 to top the gainer's list on the BSE, while other oil and gas producers such as Cairn India and Oil India and GAIL India rose 2-4% each. Reliance Industries, however, ended flat. The metal pack firmed up due to a rebound in commodity prices, with Vedanta, Hindalco and Tata Steel gaining 1-5% each. 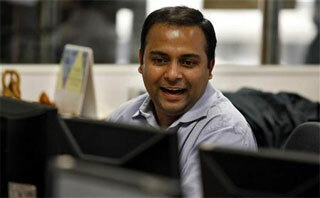 The IT sector also hogged the limelight, with Infosys and Wipro gaining more than 2% each on the BSE. Among other shares, logistics companies rallied higher for the third straight day on hopes that the government is considering reconvening Parliament to make another attempt to pass the Goods and Services Tax (GST). VRL Logistics, Transport Corporation of India, Patel Integrated Logistics, Gati,Sical Logistics, Snowman Logistics and Allcargo Logistics are up over 5% each. On the other hand, HDFC witnessed profit-booking after zooming 8% in the previous session. The financial major shed around 1% to top the loser's list on the BSE. Pharma stocks also saw some profit-booking, with Sun Pharma and Lupin shedding around 1% each in late-noon trades.